Welcome to our latest chapter of our Then & Now series where we have a look at the very first reference of a specific Rolex model and compare it to its most recent iteration. Sometimes the resemblances are striking, while other times they look like completely different models. Continuing our journey though Rolex’s history, we now arrive at the Explorer II. Join us as we compare Rolex Explorer II models by investigating the differences and similarities between the first Rolex Explorer II vs. the current Rolex Explorer II. It was 1971 when Rolex unleashed the Explorer II. This was the first time the company released a “Part II” of a particular model—in this case it was a follow up to the Explorer I. While both watches were positioned as sturdy tool watches for adventurers, the Explorer II offers more functionality by having a very niche audience in mind. Rolex built the Explorer II for polar explorers and speleologists; i.e. people who spend time in places like the Polar Regions and dark caves where they can’t depend on the presence or absence of sunlight to tell them if it’s day or night. The first reference in the family was the Explorer II ref. 1655. It featured a stainless steel 39 mm Oyster case topped with a fixed steel bezel engraved with 24 hours. That bezel is used in conjunction with the extra 24-hand on the black dial as an AM/PM indicate to tell the wearer if it’s day or night. That extra 24-hour hand is a signature design feature of the Explorer ref. 1655 with its bright orange color, large triangular shape, and lume-filled center. In fact, the orange arrow-tipped hand eventually led to its nickname, “Freccione,” derived from the Italian word for arrow. The Explorer II ref. 1655 is also sometimes called the “Steve McQueen” in watch collecting circles, despite the fact that it is highly questionable that the actor ever wore one. Also on the dial are plenty of luminescent accents for legibility in the dark including on the center pencil-style hands with pointed tips. Furthermore, there’s the date window at 3 o’clock along with the Cyclops magnifying lens jutting out from the acrylic crystal. Powering the Explorer II ref. 1655 is the Rolex Cal. 1575 self-winding GMT movement with the hacking feature. Rolex produced the Explorer II ref. 1655 from 1971 until the mid-1980s, only to be replaced by the Explorer II ref. 16550. The Rolex Explorer II underwent several design and technical modifications over the course of its history. In 2011—the year the Explorer II celebrated its 40th anniversary—Rolex released the Explorer II ref. 216570. While we see a few similarities to the very first reference, the Explorer II ref. 216570 is a quite a different watch altogether. First, it includes a large 42mm Oyster case. In fact, the Explorer ref. 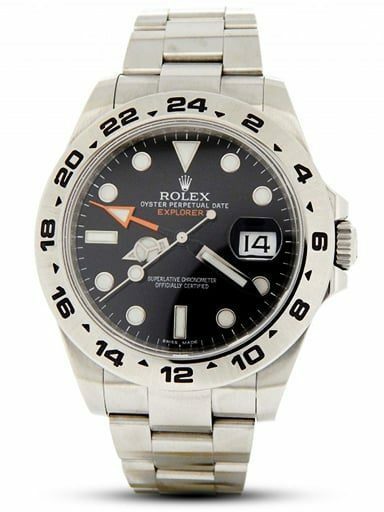 216570 is the largest Explorer II to date as previous versions (that came after ref. 1655) featured 40mm cases. The Explorer II ref. 216570 still has a fixed steel bezel engraved with 24 hours, but the font is much bolder than the original. Furthermore, the Explorer II ref. 216570 comes with a choice of a black or white dial, which houses the familiar orange 24-hour hand. However, this time, because of the Caliber 3187, the Explorer II ref. 216570 is a GMT watch, able to track to two time zones rather than just offering an AM/PM indicator. This is possible because the 24-hour hand is set independently from the center hour and minute hand. This allows the wearer to point to another hour on the 24-hour marked bezel. Rolex styled the dial of the newest Explorer II differently to the maiden Explorer II. It features the round lume plots and Mercedes-style hands typical of many of today’s Rolex sports watches. As a modern Rolex watch, the Explorer II ref. 216570 comes equipped with up-to-date details like a sapphire crystal, Chromalight luminescence, and an Oyster bracelet with the practical Easylink 5 mm extension system. The Explorer II ref. 1655 and Explorer II ref. 216570 are fantastic Rolex watches in their own unique ways. The Explorer II ref. 1655 “Steve McQueen” is now a highly collectible vintage Rolex watch in the secondary market while the Explorer II ref. 216570 is an ultra-modern and more practical take on the adventurer’s watch. While the connection between the two watches is there, the first and current Explorer II watches will most certainly appeal to two very different audiences.